To be quarried, the columns must be extracted from exposed rock ridge faces. From here, the columns can be carefully cut into lengths and diameters. The rock is beautiful in it’s natural state, but can be polished. Left natural, the columns have a greyish brown outer crust. The crust is a result of sediment settling between the columns. Crystallization can occur given perfect conditions, and this process results in the highest quality of columns, leaving a pure black interior. Basalt Columns come in a variety of diameters and lengths. Some quarries produce columns up to 6 feet, 4 to 6 inches in diameter. Some are quarried at lengths over 20 feet, and as much as 24 inches in diameter. Smaller columns are produced by lava cooling at a faster rate. Starting at just $38.00 per lineal foot, these columns give great value that immediately enhances your landscape project. Hillside Stone & Garden has a large selection of columns that have been drilled, also known as Gurglers, for use in water features such as ponds or fountains. We can also custom drill and polish any basalt column to give your project that additional eye popping appeal. 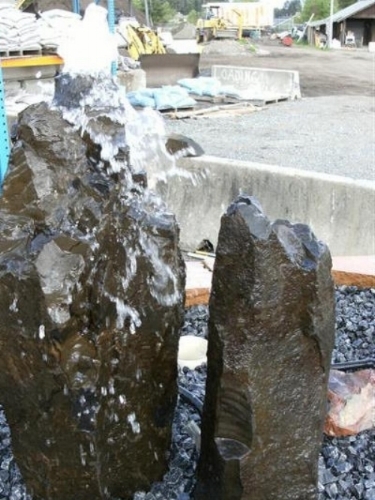 Basalt can also be used for a number of other decorative projects including: Benches, birdbaths, ponds, fountains, monoliths, retaining walls, and sculptures. 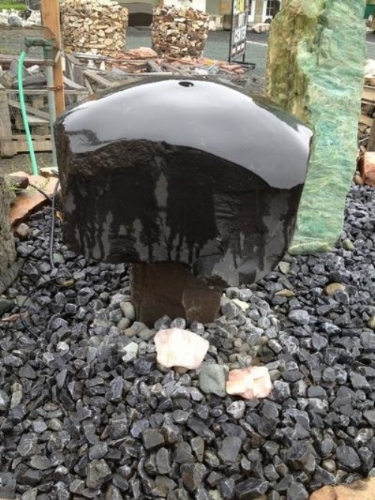 Dish rocks are pieces of the same basalt columns, in smaller sizes they make great bird baths and water features or even a wishing well. They can also be polished or drilled to meet your needs. We carry a wide variety of sizes.